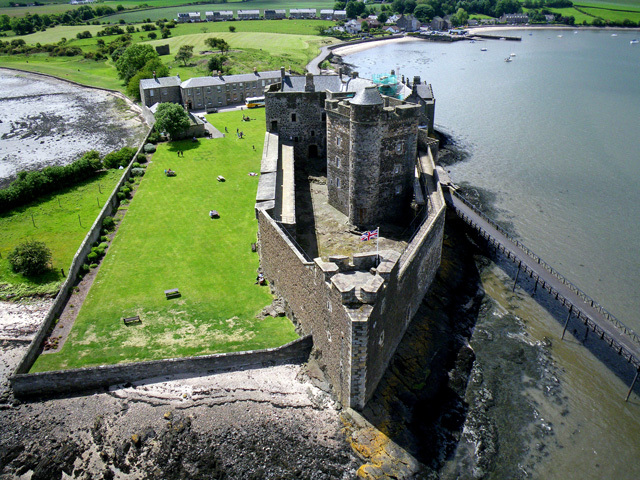 Notes: Blackness Castle is a 15th-century fortress, near the village of Blackness, Scotland, on the south shore of the Firth of Forth. It was built, probably on the site of an earlier fort, by Sir George Crichton in the 1440s. At this time, Blackness was the main port serving the Royal Burgh of Linlithgow, one of the main residences of the Scottish monarch. The castle, together with the Crichton lands, passed to James II of Scotland in 1453, and the castle has been crown property ever since. It served as a state prison, holding such prisoners as Cardinal Beaton and the 6th Earl of Angus. Strengthened by Sir James Hamilton of Finnart in the mid-16th century, the castle became one of the most advanced artillery fortifications of its time in Scotland. A century later, these defences were not enough to prevent Blackness falling to Oliver Cromwell's army in 1650. Some years after the siege, the castle was repaired, and again served as a prison and a minor garrison. In 1693, the spur protecting the gate was heightened, and the Stern Tower shortened as a base for three heavy guns. Barracks and officers' quarters were added in the 1870s, when the castle was used as an ammunition depot, until 1912. The castle was briefly reused by the army during World War I. It is now a Scheduled Ancient Monument, in the care of Historic Scotland. Because of its site, jutting into the Forth, and its long, narrow shape, the castle has been characterised as "the ship that never sailed". The north and south towers are often named "stem" and "stern", with the central tower called the "main mast".Since the castle's restoration, it has been open to the public as a historic monument. The buildings of the castle stand empty, although there is a small exhibition in the former barracks outside. The castle has been used as a filming location in several productions, including Franco Zeffirelli's Hamlet (1990), Bob Carruthers's 1996 film The Bruce, a BBC/A&E television miniseries of Ivanhoe (1997), and the science-fiction film Doomsday.